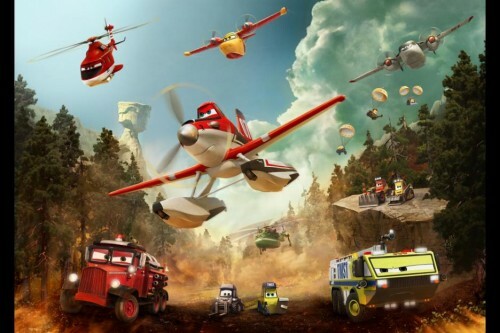 The JavaKids and I were able to attend a sneak preview of Planes: Fire & Rescue earlier this week for the purposes of giving our review of the movie. Amongst the other invited guests were area firefighters, as the theme of the movie centered around the vehicles who fight forest fires and the opening credits dedicate the movie to the men and women who save lives every day as firefighters. This movie is of course a sequel to Planes, where we first met the main character, Dusty Crophopper (voiced by Dane Cook). Now a world-famous racer, Dusty discovers that he has a failing part that may soon end his racing days. As a result of testing his limits, he accidentally sets his hometown’s airstrip on fire, attracting the scrutiny of the safety department, which informs Dusty and his friends that the airport will be closed until improvements can be made, including updating the current fire engine and finding a second firefighting vehicle. This sets the stage for a guilt-ridden Dusty to go off to Piston Peak National Park to learn how to be an aerial firefighter. Here we meet the brave crew who fights fires, the legendary fire and rescue helicopter Blade Ranger, scooper Dipper (voice of Julie Bowen), heavy-lift helicopter Windlifter, ex-military transport Cabbie, and the Smokejumpers, a team of all-terrain vehicles who jump out of Cabbie and fight the fires from the ground by creating “breaks” and clearing paths. Fires aren’t the only enemy the team faces. The Superintendent, who runs the National Park and more specifically is interested in his pet project the newly renovated lodge, is less concerned with safety than with dazzling VIP guests. Do kids in the audience understand the theme of bureaucracy and budget cuts and what happens when money is diverted to build pet projects? Well, maybe not as well as adults, but my kids (ages 8 and 10) understood it enough and it opened the door for some conversations, and to me, any time a movie does that, it’s a win. Like the other movies in the Cars and Planes franchise, there are some jokes thrown in there that only the adults will get. There are a couple of romance themes. And there are times when the stories get a little clunky. For example, it took me a little bit to realize that Windlifter is supposed to be an Apache helicopter and therefore his off-the-wall-sounding stories are supposed to be Native American lore (I think?) so the way the characters respond to him (“Oookay…”) are not necessarily the most appropriate. But translating lore to vehicle-speak comes out sounding very bizarre. So it may be worth discussing that with the kids. The visuals are stunning and yet not frightening. Hint: Stay a little bit through the credits for one last joke. Overall, there are several good themes you can pick out in the story. The kids and I discussed several, including the fact that there can be more than one solution to a problem; the benefits of opening up and telling someone when you are afraid of something; what it means to be brave; and what the Superintendent was doing that was wrong. There are more, but I don’t want to spoil things. Is it cinematically perfect? No. Professional reviewers will pick apart elements of the storytelling and characterization. But from a family’s point of view, it was entertaining, provided a platform for deeper discussion, and we walked away smiling. The only regret I have is that I didn’t think to ask any of the firefighters in the audience what THEY thought of the movie. Planes: Fire & Rescue opens today, July 18 and is rated PG. You can learn more about the movie on the web site or Facebook page. Image copyright of Disney, provided as part of media kit.